In response, Kid Robot humorously knocked off the Bellhedz promotional material (above right) and is holding a "Death to False Vinyl Rally" today (September 4th) in New York City where they'll be giving away over a thousand Dunnys (11:30am-1:30pm at Houston & Lafayette, just off Broadway). I love dunnys and have over 300 different ones. Obviously they are copies, but whatev. More interest will just make the hobby grow and hopefully kids will then turn to the real thing. 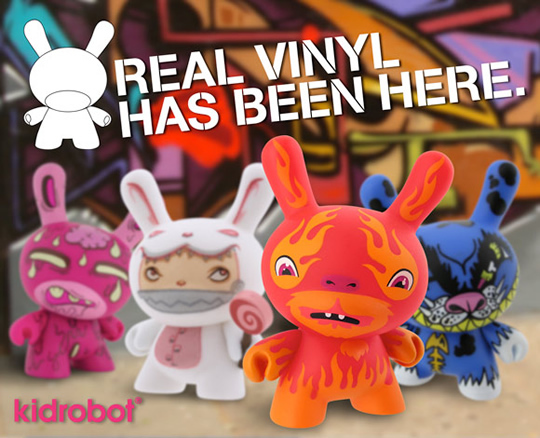 Notice how Kidrobot turned it into a promotional event for themselves. It is just people trying to make a buck. The quality will always rise to the top. BOYCOTT TACO BELL UNTIL THE BELL HEDZ ARE DEAD. This Boycott started yesterday and will continue until they remove all Bell Hedz from all locations. Thousands have already joined in this boycott. MIKKO MERONEN of Strottman should have thought twice before ripping off Kid Robot. He better have a damn good lawyer. Strottman should be ashamed of themselves for hiring this thief. i think these are awesome and will do alot for awareness for the vinyl community. Kids will love these and will be looking for more after the promotion is over and will move on to retail to get them! As for Mikko, I think he's brilliant! Uhh, kids value meals rip off toys ALL the time. Where the hell have you people been? My heart goes out to all of the people at Kid Robot that MIKKO MERONEN OF STROTTMAN ripped off. Several industry sources have confirmed that Kid Robot has issued a cease and desist letter to Taco Bell, and Taco Bell has been cooperative. I have received thousands of emails from people joining the boycott until Taco Bell removes all Bell Hedz from all locations. The public is tired of corporate scandals where big companies pick on the small guy. Taco Bell has an opportunity to do the right thing here. First, they need to issue a public apology and remove all Bell Hedz. Second, they need to settle with Kid Robot. Finally, they need to show that they do not associate with companies that rip people off and hurt their livelyhoods. The Taco Bell investors will be hurt by the fallout of this as well, similar to the Bernie Madoff investors. MIKKO MERONEN AND STROTTMAN have been around long enough to know how badly this will hurt Kid Robot. Yet, they had no creative ideas of their own and ripped them off. On their website it says they understand what motivates and inspires kids. Is teaching kids to steal motivating and inspiring? MIKKO MERONEN thinks so. Finally, here is my advice to the STROTTMAN employees that keep trying to save their jobs by writing comments on here. It's time to dust off your resume and make a run for the border! Kidrobot is finally getting what they deserve. Welcome to the free market kids! Kidrobot has been an over price retail whore for years. Selling 3 cent china made toys for top dollar. Quit you bitchen kidrobot - this just brings more kids to your world. Toco Bell jumped on a trend and I hope they have success. Strottman keep on rockin in the free world. Toco Bell has seen double profits since the boycott. This PR just boosts the brand numb nutz. Plus kid robot ripped off the dunny from a toy designer years ago... get a life kidripoffbot. People need to get a life. Seriously. They're TOYS. If you're boycotting a restaurant because you think they're copying your favorite toys and you aren't an 8 year old kid, you need therapy. Dear Michelle. boycotting is the way consumers vote with their pocketbooks, saying they are unhappy about a situation and want change. Your comment has psycological implications that would be funny if not so sad. There's a story about a pot and a kettle. Connect the dots. Congratulations to all of you who continue to join the boycott! As of today, YUM BRANDS stock is down -6.13% since the boycott began. Taco Bell has seen their profits tumble since the boycott began and they will keep going down. 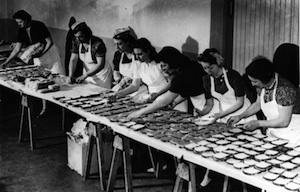 During the same time, Del Taco profits have doubled. None of this would have happened if Taco Bell would have done the right thing and apologized and pulled their rip off designs off the shelf. The boycott continues to grow in numbers and more and more customers are switching to Del Taco. Our industry sources tell us that STROTTMAN has been secretly interviewing creative directors from neighboring agencies to replace MIKKO MERONEN. We think this is a good start and a public apology should follow. We will continue to boycott Taco Bell until they remove all Bell Hedz from all locations. Kid Robot's lawsuit against Taco Bell and STROTTMAN will only get bigger the longer the Bell Hedz are on the shelf. The people have voted with their pocket books. Hopefully the good that will come out of this is that future rip off artists will think twice and not want to join MIKKI MERONEN on the wall of shame. I don't really mind. I actually bought 3 of them just to see what they looked like. And for a $1.07 a piece.....they aren't that bad. Dunny = $8.99 BellHead = $1.07. 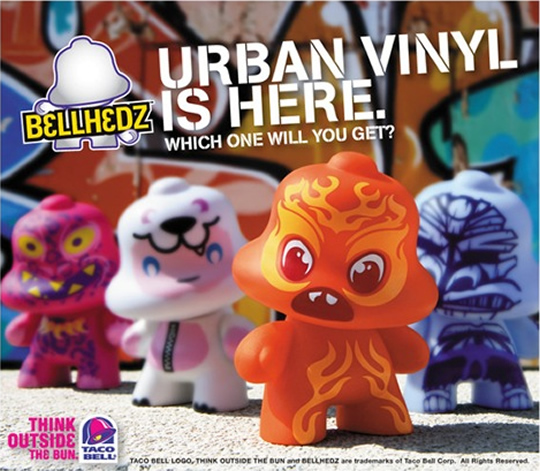 Seriously.....I don't think Taco Bell is going to make a dent in the KidRobot scene any time soon. Everyone can chill the f out. What idiot Creative Director does this and doesn't look at the fact that this is not only a rip off of great edgy well known art, but a slap in the face of good creative. What would it have taken for them to contact the people of Kid Robot and tell them the idea. I'm sure they would have been on board for their brand to be associated with Taco Bells National Brand. And it would have generated such a buss from all the collectors. All around not a well thought out approach. I am placing this at the top of our wall of shame.